Analog Artist Digital World: The Perceid Meteor Shower.. The Perseid Meteor shower is supposed to be the brightest meteor shower of the year. According to NASA meteor expert Bill Cooke, the Perseids are perhaps the most popular meteor shower of the year. Typical rates are about 80 meteors an hour, but in outburst years (such as in 2016) the rate can be between 150-200 meteors an hour. The meteor shower's actual peak was around 1 p.m. on August 12, which means that the night before and the night after will both have good rates; Cooke said the show would be slightly better in the predawn hours of Aug. 12, but that there would be a decent show both nights. Comet Swift-Tuttle is the largest object known to repeatedly pass by Earth; its nucleus is about 16 miles wide. It last passed nearby Earth during its orbit around the sun in 1992, and the next time will be in 2126. But in the meantime, the Earth passes through the dust and debris it leaves behind every year, creating the annual Perseid meteor shower. Pam Schwartz and I traveled to Magnolia Park on Lake Apopka in the hope of getting away from some of Orlando's light pollution. We arrived at the lake side park just before midnight. Several people were leaving the boat launch area in their SUV and they shouted out that a big gator was lurking there. We found a spot on a dock and waited patiently, seated on my artist stools.. In my nocturne I could clearly see the orange glow of the city light pollution on the horizon. I was afraid that this might hinder our chances of seeing meteors. Another drawback was that it was cloudy. After an hour of sitting on the dock, the clouds started to part and thin out. 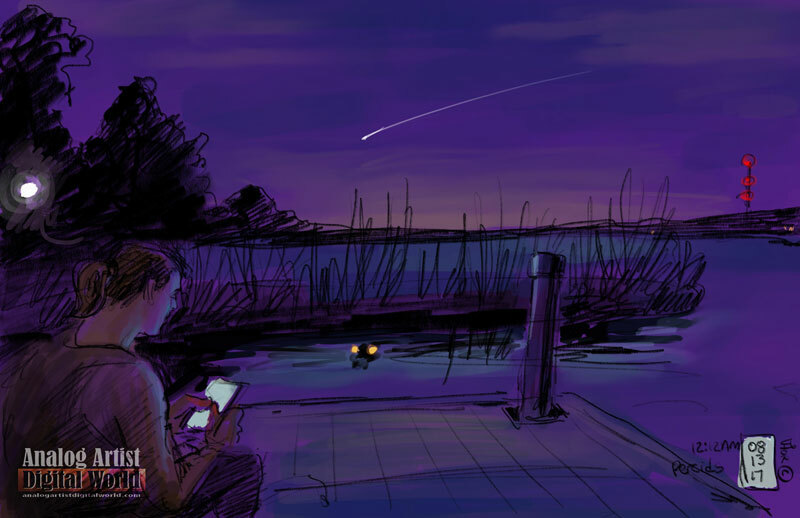 While I was staring at my sketch, Pam shouted out that she saw a meteor. I stopped sketching and stared at the night sky. In the reeds near by two beady eyes stared back at me. It was a huge gator watching us and waiting for his chance to lunge. It was kind of hard to look at the sky with those reflective lenses staring at us. I finally did see a streak of light on the horizon. It was just a flash out of the corner of my eye, but I saw it. On a different occasion I saw a meteor that was huge and seemed to linger in the sky like an open wound. If there were a hundred meteors and hour on this night they must have been only active when it was cloudy. What I remember far more vividly are those ravenous glowing doll like eyes. We left shortly after I saw my one meteor. Although the gator might have wanted blood, it was the mosquitoes that feasted the most that night.